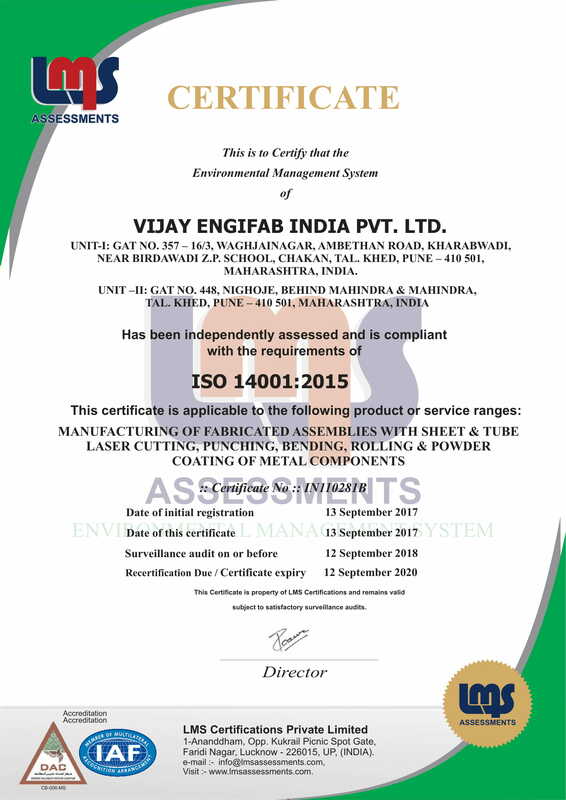 Vijay Engifab India Pvt Ltd.
At Quality Industries, our name is our standard and saturates everything we do. 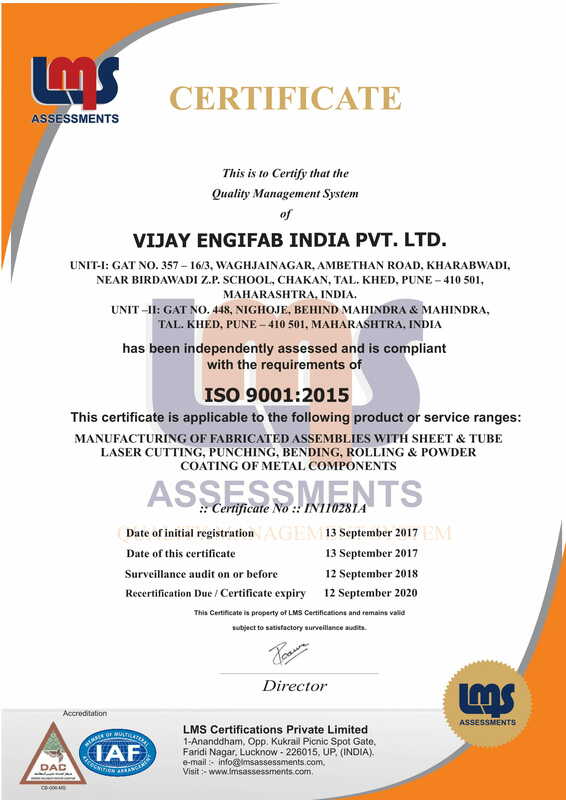 We are proud to be an ISO 9001:2015 certified company, but we don't stop here, we work closely with our customers throughout every project, striving to carefully understand objectives, engineer programs that ensure our ability to exceed customer expectations, and maintain an aggressive eye toward continuous improvement. We are confident our deep knowledge and diverse capabilities can be leveraged to create outstanding value for our customers, we are ready to meet any challenge. 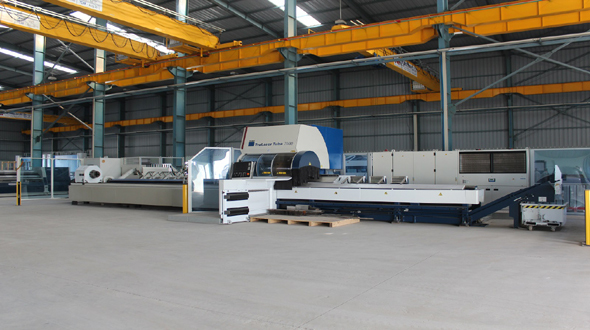 Vijay Engifab has provided custom sheet metal fabrication solutions for over 25years. We specialize in metal components and enclosures for tech industries. 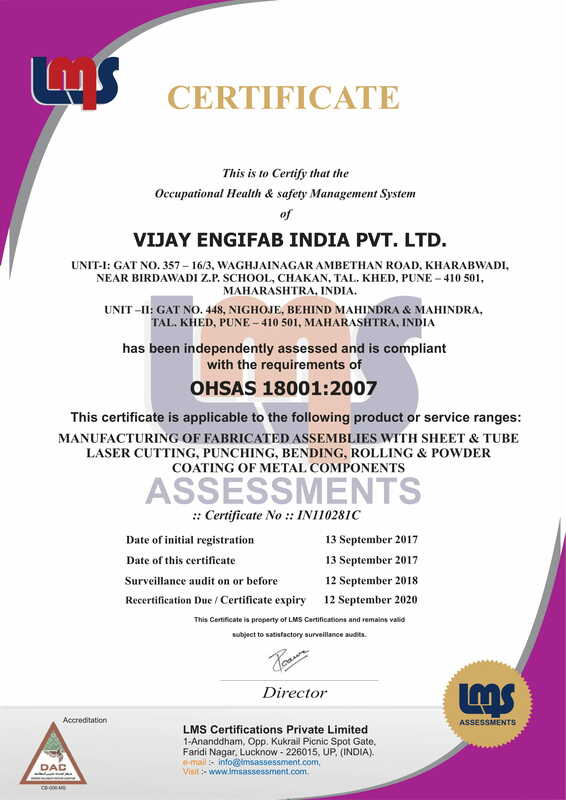 Vijay Engifab India Pvt. 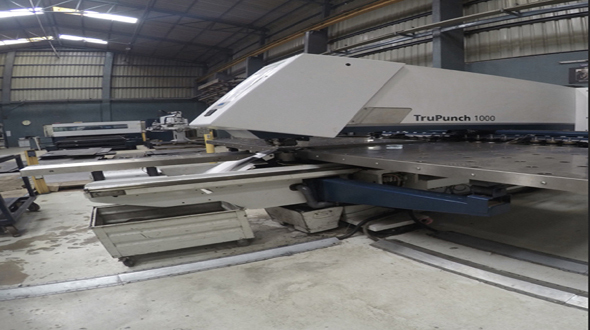 Ltd.offers laser services that lead the industry with our two machine varieties that allow us to customize to your cutting needs. 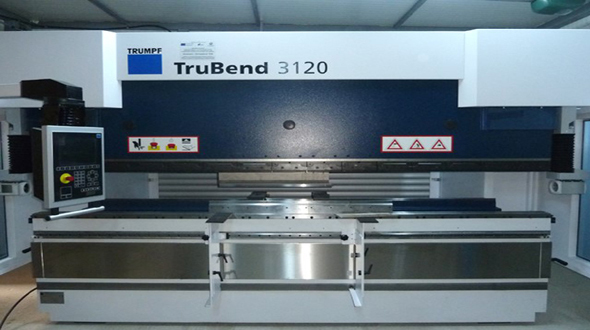 Whether you are bending delicate or oversized parts, our machine range will meet your various requirements – simply and without compromise. Vijay Engifab has provided Oxyfuel/Plasma Machine. Smart Focus 400 Amp, High Definition Series, True Hole Technology. 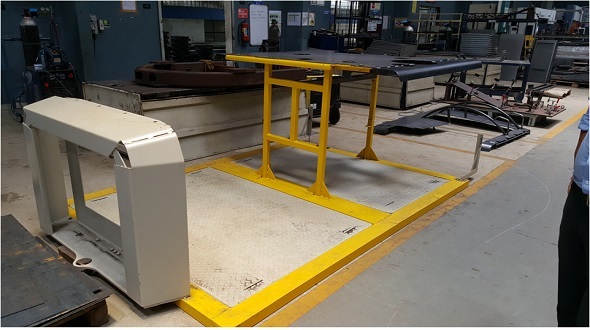 Within our ERP system, we create, organize and maintain accurate part BOMs, routings, control plans, inspection procedures and work instructions. 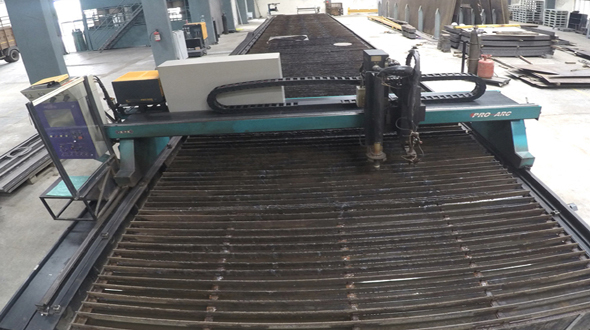 Why not work with ISO 9001:2015 certified sheet-metal fabrication and Laser cutting company. 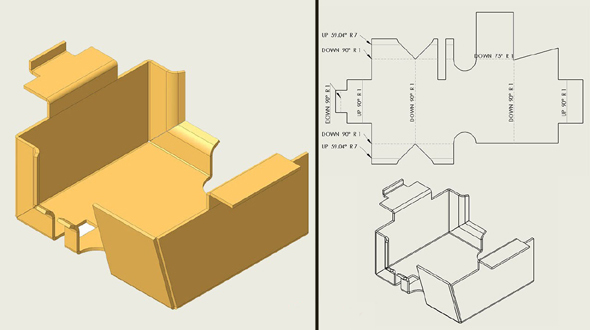 Within 10 Years of experience in laser cutting industry. Our experience includes High level of professionalism and skills. Our Track Records says it all, we are committed to deliver projects in the promised timeframe. 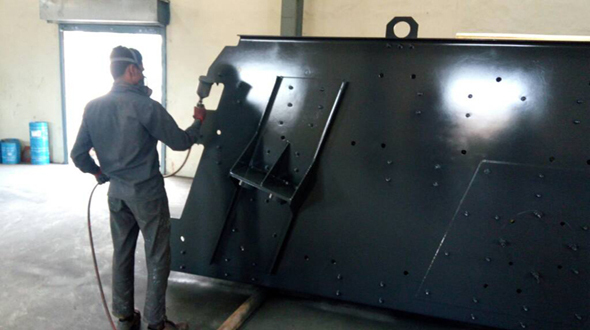 Vijay Engifab India Pvt Ltd is a complete sheet metal component & contract manufacturing company offering Laser Cutting, Punching, Plasma Cutting, Fabrication, Powder Coating, Liquid Painting, Shot Blasting & Assembly Services. 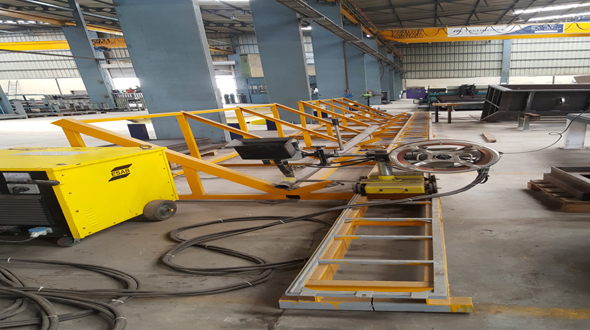 Vijay Engifab India Pvt Ltd. Copyright @ 2019 - All Right Reserved By NetCom Business Solutions.